It’s been a long week, with cold weather, and lots of rain. I’ve been shut in the entire time, and, as a result, I have lots of fragments floating around in my head. I’ll be linking them up with Mrs. 4-4-4-4 at Half-PastKissinTime. The week started off with a ‘bang’, when Ed,and many of his fellow co-workers, learned they’ll be getting a reduction in pay, beginning next week. On the bright side, some said “At least we still have our jobs.” This is true, at least for now. One fellow co-worker had been off work for several days, caring for her ailing mother, then fighting a case of stomach flu, herself, only to return to work and discover her salary was being reduced. Talk about a run of bad luck! Our youngest grandchild, Evan, was sick last weekend, and throughout the first part of the week. Without going into great details, let’s just say, he was requiring LOTS of diaper changes due to an upset tummy. He’s better now, thank goodness! Unfortunately, Evan’s dad is now sick with a cold and sore throat. Ed and I had planned a visit, this weekend, but I guess we’ll have to post-pone. It’s been three weeks since we’ve seen this family, and this Mimi is missing them a lot! I’ve posted here, a couple of times, about the local guy who escaped from jail, back in January, and has been on the run ever since. He’s been spotted in Texas, Alabama, and, now, back here, in Georgia. (I can’t begin to tell you how many vehicles this guy has stolen, among other things!) On Tuesday night, our little town was ‘a buzz’ with another manhunt, after the man was spotted in town. The manhunt made the local news, but wasn’t successful. Recently, some somebody thought it would be amusing to start a Facebook page, in support of this fugitive! Strange, but true. The page has caused quite a stir, and, once again, the story made the local news. We’re living in some strange times, when people begin to root for the bad guy! There’s even been some talk about printing t-shirts. That’s just wrong on so many levels. Does anyone remember the saga of the cats living at my MIL’s house? Well, ‘Trouble’ is still staying there, all alone, but ‘Jo Jo’ found his way to our house. The third cat, known by our grandson as, ‘Stranger Cat’ is now living at our oldest son’s house. Ed continues to go and feed ‘Trouble’ and ‘Stranger Cat’ daily, believe it or not. He tried hard to tame ‘Stranger Cat’, without any success. I suspect she’ll be delivering kittens in time for Easter, since she’s now ‘expecting’, thanks to a stray, red tom cat! My heart is heavy, today, for a cousin and her family. My cousin’s spouse has been fighting a three-year battle for his life, and the battle is nearly over. They’re an older couple, one of the rare ones who married and stayed married for the long haul. Fifty-plus years. Where you saw one, you saw the other, and one name was rarely spoken without the other. I know my cousin will be lost without her ‘other half’. Love to see the grandchildren’s work. I am amazed at how far along they are. Sorry to hear of the cutback and the sickness. The cursive handwriting is excellent. 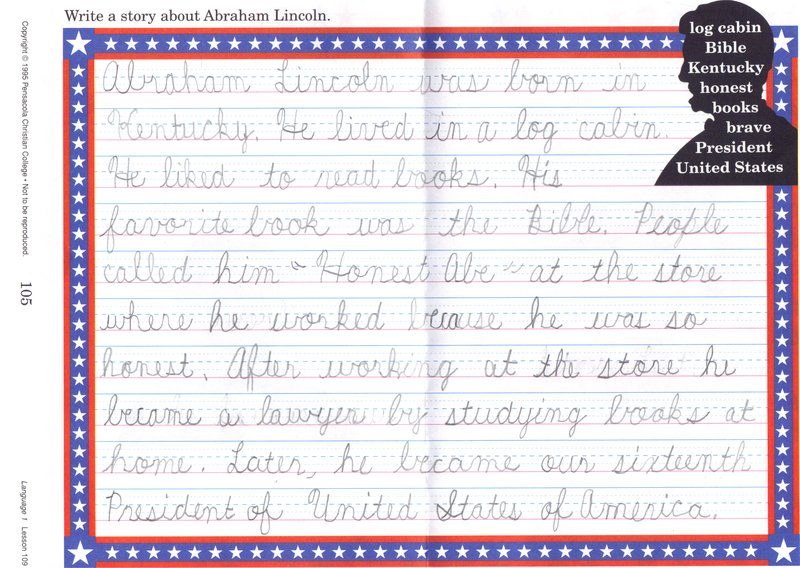 What an awesome report and pretty cursive writing. And you say she is just a first grader. Wow!! Well if you can’t tame the mama, maybe you can the babies! Looks like your daughter uses A Beka curriculum. That’s the same curriculum my kiddos are on at their school and yes, they learned cursive in 1st grade too! Although I have to say, you’re Madison has some great handwriting! Of my two kids my son actually has the best writing because my daughter has to constantly be reminded to write neatly. She’s her mother’s child! One day I finally learned to write legibly, but I prefer printing over cursive as my cursive looks much like an elementary student is writing! She has beautiful handwriting! My daughter teaches third grade in a public school, and she teaches cursive : ) She enjoys that! So sorry about your cousin, that will be a hard loss to bear. That handwriting is beautiful! I think only homeschooled kids are learning cursive these days. So sorry to hear about the pay cut … but as you said, thankfully the jobs are still there. These are tough times. My goodness, her handwriting is better than mine ever was. Since my stroke I have been reading a lot about the plasticity of the brain. One thing I read discussed how valuable the physical practice required in learning cursive helps promote beneficial growth of neural pathways in the brain. You and Ed have had a rough week. Hope your weekend brings cheerful weather and some extra happy times. Sorry about the reduction in pay but still having a job is a wonderful blessing. So sorry about the loss of your cousin’s husband. Keeping everyone in my prayers. What a great paper from Madison. I agree with you on the cursive, I don’t know why they would stop teaching it. Hope you have a nice weekend. I think it is also sad (and a huge mistake) that kids are no longer learning to use cursive. What a loss for them and future generations. And I wonder what they are doing about it in Europe?? I do hope Evan is improving as I type this!! How scary. I was told that so many schools are now not even teaching cursive. It’s good to see that this is working well….good for her.